SOF News Update 20181127 – Report on Salafi-Jihadist groups, trouble in Chechnya, Boko Haram, countering hybrid threats, Russia and the Baltic States, SWCS campus to grow, China’s spies, events, a pivot in Syria, terrorist activity map, lessons of Yemen conflict, paper on deterring aggression, sports medicine helps AFSOCs ground airmen, Hoffman on Gray Zone conflict, and more. SWCS Campus to Grow. The future complex of the Special Warfare Center is going to be similar to a college campus with many of the technological educational tools necessary to keep Army special operations Soldiers up to date on advanced special operations tactics and techniques. Read “Bragg school that trains special operations troops gets upgrade”, The Fayetteville Observer, November 24, 2018. Civil Affairs and Social Media. One CA officer argues that the Civil Affairs branch needs to add a social media analysis function to its toolkit. Read “Before the Engagement: Mapping Social Media for Civil Military Operations”, The Civil Affairs Association, November 22, 2018. Investigation of Beating Death of Afghan Commando. On October 22, 2018 an Afghan Commando turned his weapon on Czech soldiers on Shindand Air Base killing one and wounding two others. He was detained by Afghan security personnel and turned over to NATO SOF. The Afghan Commando was then returned to Afghan custody where he died. Now an investigation has been opened to determine if Czech and US SOF beat the Afghan Commando so severely that he died of his injuries. (New York Times, Nov 26, 2018). Why Gen Miller Carries a Rifle. 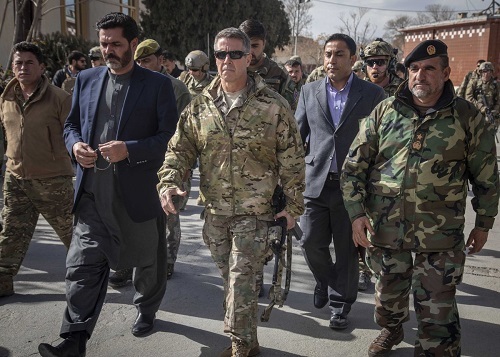 Last week the social media and news world was all up in a tizzy because the commander of Resolute Support – General Austin Miller – was carrying an M4 while visiting the site of recent heavy fighting in Ghazni, Afghanistan. The RS HQs spokesman has provided an explanation. Read “The Real Reason Why the Top US General in Afghanistan Carried an M4 Carbine”, Task & Purpose, November 26, 2018. Navy SEAL David Goggins – “Toughest Man Alive”. A retired Navy SEAL chief seems to have done it all. (Defense Media Activity, Nov 11, 2018). Marine Raiders and a GPS-constrained Environment. The U.S. may not be able to operate in the future with its GPS systems. In addition, we will likely need the capability to interdict other countries navigational systems as well. (Marine Corps Times, Nov 22, 2018). 7th SFGA Interacts with ICRC in Exercise. Members of the 7th Special Forces Group recently took part in Warfighter 19-02 at Fort Bliss, Texas. Part of the exercise involved improving the ability of the SF group to interact with humanitarian assistance organizations. Read “7th SFG(A) exercise human assistance, interoperability”, 7th SFG DVIDS, November 8, 2018. 3rd SFGA Body Builder Explains His Training Routine. A member of the 3rd Special Forces Group recently competed at the national level for body building. Read “Under the Uniform”, 3rd SFGA DVIDS, November 21, 2018. 7th SFGA Honors Specialist Jividen. The 7th Special Forces Group recently recognized one of their own when they named a forward operating base established during exercise Warfighter 19-02. Jividen was an intel analyst assigned to 3/7th who passed away during a training accident at NTC on November 6, 2018. 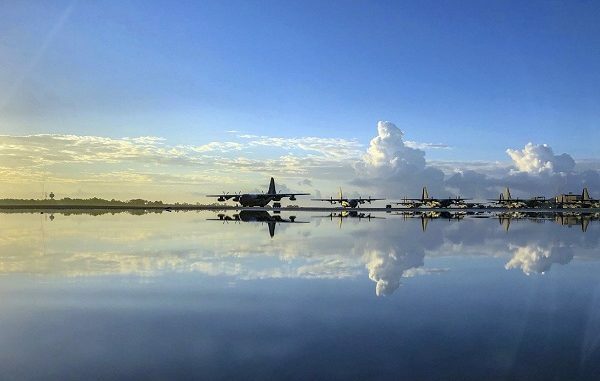 (DVIDS, Nov 8, 2018). AFSOC and Sports Medicine. Air Force pararescuemen take a physical punishment over the course of their careers. However, the 350th Special Warfare Training Squadron is taking steps to mitigate injuries through a sports medicine program. Read “Here’s how sports medicine is transforming battlefield airmen’s training”, Air Force Times, November 23, 2018. SOCOM Contract for Drone Capability. Insitu has been awarded an $18 million contract for ISR services. (UPI, Nov 23, 2018). MoH to be Donated to 7th SFGA. The first Medal of Honor earned in the Vietnam War will be donated to the 7th Special Forces Group by retired Army Colonel Roger Donlon. When he was a Captain serving with the 7th SFGA in Vietnam Roger Donlon earned the MoH in 1964. Read “First Medal of Honor won in Vietnam coming to 7th Group Headquarters”, Panama City News Herald, November 23, 2018. CSIS Report on the Salafi-Jihadist Threat. A team of writers from the Center for Strategic & International Studies has penned a 78-page report entitled The Evolution of the Salafi-Jihadist Threat. It details the current and future challenges from the Islamic State, Al-Qaeda, and other jihadist groups. The report findings suggest that there is still a large pool of Salafi-Jihadist and allied fighters in conflict areas around the world. The report suggests that it would be a “. . . mistake declaring victory over terrorism too quickly and, as a result, shifting too many resources and too much attention from terrorist groups when the threat remains significant.” (CSIS, Nov 20, 2018). ISIS in Pakistan. The Islamic State may be making inroads in Pakistan. However, the country’s government may be ignoring the warning signs of a growing threat. See “Pakistan’s dangerous denial of ISIS presence in the country”, Observer Research Foundation (ORF) India, November 16, 2018. Mapping Terrorist Attacks. The map folks at ESRI have a neat interactive map that depicts terrorist attacks around the world. You can filter by terrorist group or location. Zoom in or zoom out. China and Spying for Technological Advantage. China has a deep history of using spies to obtain technology and trade secrets. The U.S. is responding to these illegal attempts to gain technology. Read more in an article by Scott Stewart entitled “Espionage in the Great Power Struggle”, Real Clear Defense, November 21, 2018. Trouble in Chechnya. Ramzan Kadyrov is creating new problems for Vladimir Putin. Read “The Kremlin Cannot Continue to Ignore the Chaos in Chechnya”, The National Interest, November 19, 2018. Russia and the Baltic States. One political commentator, Emily Ferris, believes that Russia does not have ambitions in the Baltic states that are military in nature. But it does other ambitions. Read “Probing the Baltic States: Why Russia’s Ambitions Do Not Have a Security Dimension”, RUSI.org, November 21, 2018. Countering Hybrid Threats. The new European Centre of Excellence for Countering Hybrid Threats (Hybrid CoE) in Finland is playing a unique role in facilitating cooperation in the countering of hybrid threats. Read more in NATO Review Magazine (Nov 23, 2018). The Syrian Pivot of Trump. Seth Harp visits Syria and finds that there are ‘several’ U.S. objectives for the 2K to 4K troops in Syria. Read “Is the Trump Administration Pivoting the Fight in Syria Toward a War With Iran?”, The New Yorker, November 26, 2018. Influencing Saudi Arabia. The killing of Jamal Khashoggi in the Saudi embassy in Turkey has cast the relationship of the U.S. and Saudi Arabia into turmoil. Despite Saudi Arabia’s dependence on the U.S. the United States seems reluctant to use its position to influence the actions of Saudi Arabia. Read more in “Could America Use Its Leverage to Alter the Saudis’ Behavior”, The RAND Blog, November 15, 2018. Yemen and ‘Partnered Operations’. War by proxy is one way that the U.S. can achieve national objectives yet not spend too much treasure or blood. But sometimes the allies of the U.S. are working towards their national objectives – not those of the U.S. The situation in Yemen (U.S. support of Saudi Arabia and UAE) provides lessons relevant to future partnered operations in the rest of the world for the U.S. Read “Extricating the United States from Yemen: Lessons on the Strategic Perils of Partnered Operations”, Lawfare Blog, November 25, 2018.
. . . move beyond sectarian rhetoric and policies.” Iraq can do this by combining top-down decentralization and bottom-up mobilization. Repeating Syria Elsewhere? Daniel Byman, a Senior Fellow of Foreign Policy at the Center of Middle East Policy, provides his perspective on the ability of the Islamic State to set up a ‘caliphate’ in the future that resembles what ISIS had in Syria. Read “Was Syria different? Anticipating the Next Islamic State”, Brookings Institute, November 20, 2018. Boko Haram – Can Deradicalization Work? The U.S. State Department is planning on spending millions of dollars to deradicalize fighters in Niger. Are we wasting money. Read “Boko Haram brought terror to Niger. Can a defectors program bring peace?”, The Washington Post, November 20, 2018. CRS Paper on RAS and AI. The Congressional Research Service has published (Nov 20, 2018) a 47-page report entitled U.S. Ground Forces Robotics and Autonomous Systems (RAS) and Artificial Intelligence (AI): Considerations for Congress. Deterring Aggression. There are competing interests around the world and sometimes this competition takes the form of aggressive acts – for instance, the latest antics of Russia in the Kerch Strait. But it’s not just Russia – China is expanding its military presence by encroaching on international waters and restricting freedom of navigation (FON). Other ‘bad actors’ are posing difficulties around the world. So how can the United States lessen the amount of aggressive actions? Read more in What Deters and Why: Exploring the Requirements for Effective Deterrence of Interstate Aggression, RAND Corporation, November 2018. Trump’s Drones. According to one news article the current U.S. president inherited a policy of using drones to kill terrorists – and has actually increased drone use. Read “Trump Ramped Up Drone Strikes in America’s Shadow Wars”, Daily Beast, November 25, 2018. Scales on the Close Combat Lethality Task Force. Retired MG Bob Scales writes about the task force that he is on to increase the capability of the U.S. foot soldier. Read “Mattis’s Infantry Task Force: Righting ‘A Generational Wrong'”, Breaking Defense, November 26, 2018. Canada’s Rangers of the Far North. A group that traces their history back to the Second World War numbers about 5,000 members. They provide a variety of services to include wilderness survival experts, disaster relief, search and rescue, and more. Read “Canada’s northern Rangers lead the way”, Toronto Sun, November 24, 2108. Hoffman on Gray Zone Conflict. The U.S. needs to recognize the diversity of potential conflicts and understand the relative risk of each. Not only does the U.S. face threats from great power competition but there are other types of conflict that it must be able to respond to as well. Read the thoughts of Dr. Frank Hoffman, of the National Defense University, in “Examining Complex Forms of Conflict: Gray Zone and Hybrid Challenges”, Prism, National Defense University, November 8, 2018. November 27, 2018. Washington, D.C.
CSIS will conduct a forum that examines the prospects and priorities for U.S. Gray Zone competition. It will be held in D.C. and also can be seen via webcast. Military Capacity Building – Norway and NATO. This event examines military capacity building as a solution to Norway’s and NATO’s security challenges in fragile states. Photo: AC-130s on airstrip Hurlburt Field. AFSOC, November 2018.